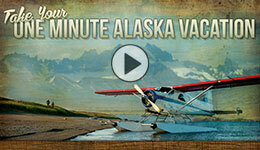 Check out this months edition of our One Minute Alaska Vacation with footage provide by guests from the 2017 season. Guests at Crystal Creek Lodge are encouraged to share their collected media during their stay. Both images and videos are welcome and are easily uploaded to our media station located in the bar. It’s a fun way to participate and share your experience with others. Plus, you might see your “happy face in your happy place” posted through one of our various outlets. Bring it on!